Chef Betty Vázquez accompanied the team to New York, where they held several events with some 30 media sources whose circulation will result in millions of advertising impressions. The Riviera Nayarit Convention and Visitors Bureau (CVB) and Chef Betty Vázquez took advantage of the May celebrations from the 5th through 9th to visit New York and hold series of promotional activities with the media, which in turn generated huge exposure throughout North America. There were four events where the Riviera Nayarit’s culinary ambassador shone as she demonstrated her cooking with a seafood theme, “Con Sabor a Mar” (Taste of the Sea), aimed at promoting the destination. Meanwhile, the CVB held face-to-face interviews with the media during the five days of the tour. On May 5th the Mexican Chamber of Commerce’s northeast US office held a celebratory dinner with the Riviera Nayarit as the platinum sponsor. 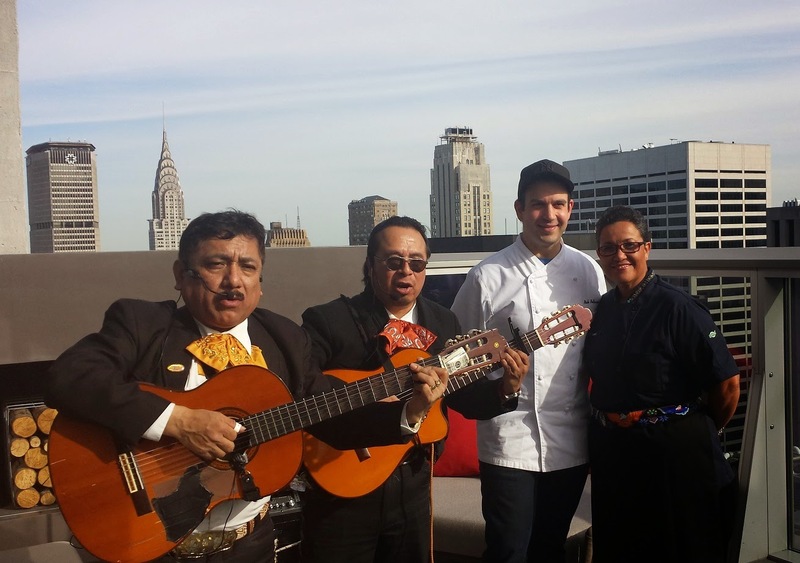 That same night guests, outside clients and journalists were serenaded by mariachi music as they enjoyed the delicious entrées prepared by Chef Vázquez at B54, the bar on the top floor of the new Hyatt Times Square. It’s currently the hottest bar in town with the best view of the heart of the Big Apple. There were 14 different media present during these two events, among them: Travel + Leisure (circulation 5,577,717), Reader’s Digest (circ. 5,578,357), Shape (circ. 1,582,687) and MSN.com (192,403,258 page views per month). On May 8th, Chef Betty took over the employee cafeteria at The New York Times, where there a meeting was held with the directors of the daily paper. The New York Times has a circulation of 1,865,318. Finally, on May 9th, the target was Saveur, the most important culinary themed magazine in the United States, with a circulation of over 300 thousand. A five-course dinner took center stage and made quite an impression on the magazine’s editorial team. As mentioned before, besides the events there were direct interviews with media representatives specializing in general information, tourism, weddings, gastronomy, wine, and the Hispanic market in the United States, as well as freelancers. The team had contact with around 30 different media in total. Other standout interviews included time with Departures (circ. 1,111,423), Vogue (circ. 1,222,373), New York Daily News (circ. 516,165) and Latina Magazine (circ. 506,934). The sum total of all possible impressions is in the millions, which will no doubt generate incredible visibility for Mexico’s Pacific Treasure.